Beijing, China (CNN) -- The Chinese government was defending its Internet practices Thursday, even as censorship of Google results -- which had briefly been lifted -- appeared to return. Chinese officials' assertion that China "works hard to encourage the healthy development and expansion of the Internet" came a day after Google said it may close its China-based site. Foreign Ministry spokeswoman Jiang Yu spoke after Google announced that a "highly sophisticated and targeted attack" from China targeted it and the e-mail accounts of at least 20 others, evidently to gain access to the e-mail accounts of Chinese human rights activists. The activists were in the United States, Europe and China, a Google spokesman said. The attack resulted in the theft of intellectual property from Google, and attackers routinely gained access to the e-mail accounts of dozens of activists -- albeit not through the Google network, according to David Drummond, senior vice president of corporate development and chief legal officer for Google. As a result of the attacks, Google has decided to stop the "self-censorship" of its Google site in China and may shut down its site and its offices in China, Drummond said. Jiang said Google's claims "raised very serious concerns and questions." "I stress that China's Internet is open," Jiang said during a news conference in Beijing. "The Chinese government works hard to encourage the healthy development and expansion of the Internet, and works to create a favorable environment for that. Chinese law prohibits cyber attacks, including hacking, and administers this according to the law." Previously, a search for "Tiananmen" would only return images of the square itself. Pages appeared to fluctuate between uncensored and somewhat censored throughout Wednesday and, by Thursday, government censorship of Google seemed to have been restored, with terms such as "Tiananmen Square" returning limited results. Jiang emphasized that China "welcomes international Internet enterprises to enter China according to the law." Chinese newspapers have reacted to the flap on opinion and editorial pages. The state-run Global Times said Google's departure would create a "setback to China" and "serious loss to China's Net culture." "[Google's] strategic loss would be greater than its business loss," the Global Times said. 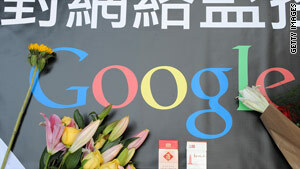 A Shanghai Morning Post editorial said Google should not "abandon" China. The Beijing-based Economic Observer said the search engine's departure would "be a sad result of Chinese Internet users." The Chinese government said through its Embassy in Washington Wednesday that it welcomes foreign Web-based enterprises and is working "to promote sound development of the Internet." "The Internet in China is open," said Xi Yanchun, a Chinese embassy spokesman. "It is illegal to assault the Internet. China [welcomes] foreign Internet enterprises to do business legally in China." Since Google started operating in China in 2006, thousands of search terms have been censored, Google officials acknowledge. The recent "attacks and the surveillance they have uncovered ... have led us to conclude that we should review the feasibility of our business operations in China," Drummond wrote in a statement. If Google ends operations of its Google.cn Web site, it will still make Google.com available, a spokesman said. The cyber attacks detected last month included assaults on a wide range of businesses -- including the Internet, finance, technology, media and chemical sectors, Google said. "We are currently in the process of notifying those companies, and we are also working with the relevant U.S. authorities," Drummond said.